Unleash the force with Uncle Milton's Star Wars Science The Force Glove. Using the power of magnetism, The Force glove lets you attract and repel metal objects with the palm of your hand. Simply flip the magnet to choose between FORCE PULL and FORCE PUSH, giving you the power to push away droids or pull in a light saber. 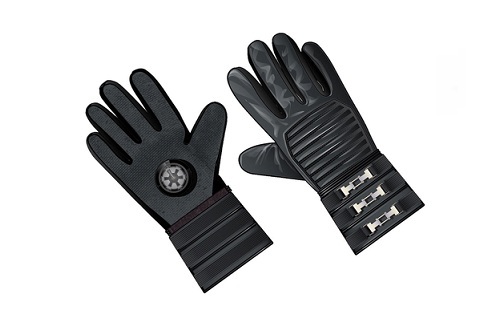 The Uncle Milton Star Wars Science The Force Glove allows you to harness the power of the force like Anakin Skywalker. This stylish black glove with silver trim features durable rubber padding on its palm with a circular metal disc sewn in. The included puck-shaped magnet features engravings on both sides, indicating which side is for FORCE PUSH and FORCE PULL. Simply attach the magnet to your Force Glove and control the power of the force with your own hand. Included with the Force Glove is a magnetic base with attachable Force target cut-outs of battle droids and a lightsaber. Use the palm of your glove to push the trade federation droids away, then flip the magnet around and pull the lightsaber into your hand. Our testing team found that the included magnet is not particularly strong, and is much more adept at pulling objects in than it is pushing them away. Still, the glove is strikingly designed and durably constructed. Also, running around the house drawing in metallic objects without grabbing them is an inherently fun activity that will keep Star Wars fans entertained for hours. Price: $10.83 & eligible for FREE Super Saver Shipping on orders over $25.